While you were preparing for your Earth Day festivities last week, firefighters in the tiny country of Nicaragua were celebrating the arrival of a big gift, courtesy of the Bend Fire Fighters Foundation. Condega Fire Chief Jaime Delgado Cultura and a crew of Nicaraguan "bomberos"—firefighters—stand in front of the equipment donated by the Bend Fire Fighter's Foundation. 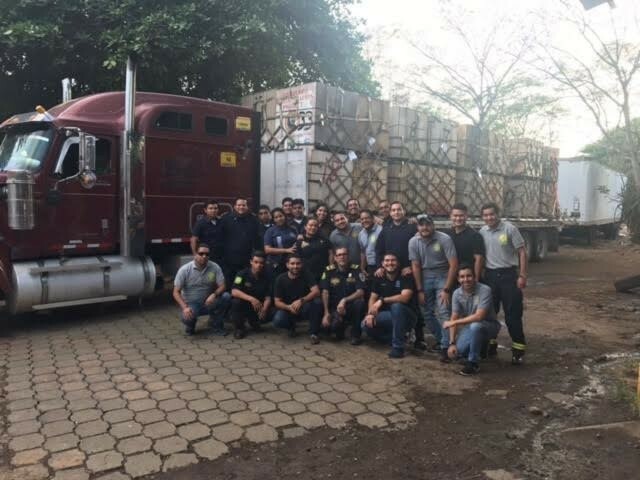 Last week, the Condega Bomberos Project, part of the Bend Fire Fighter's Foundation, delivered over 7 tons of used, but usable firefighting equipment and clothing to the Nicaraguan fire service. Firefighters in Bend brought the goods from a storage container to Kingsley Airfield in Klamath Falls in February, where it was then flown to an airbase in South Carolina, and on to Managua, Nicaragua, the country's capital city. This is the third shipment Bend firefighters have contributed to Nicaraguan teams since 2005. Originally intended to support Bend's sister city, Condega, the program now assists the country's broader Nicaraguan fire service. After Haiti, Nicaragua is the poorest country in the Western Hemisphere, and relies on international donations to support its fire programs.